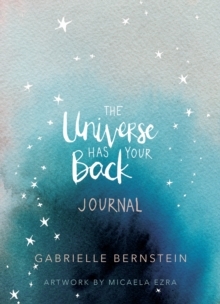 Hold space for your dreams and manifest your greatest desires with this inspiring journal from #1 New York Times bestselling author Gabrielle Bernstein. Within this journal exists a sacred and beautiful space for you to document your most intimate shifts. Let its pages be like a best friend who's always there to listen, and enables you to deepen your connection to the Universe and open up to the magnetic force of love within you. Be inspired by 108 beautiful, original watercolour designs and mantras from The Universe Has Your Back and let love flow through your pen as you unapologetically write your visions on these pages, knowing that the Universe will deliver. Gabrielle Bernstein has been inspiring spiritual seekers for over a decade, with hundreds of thousands of people across the globe following her work. In her bestselling book The Universe Has Your Back, Gabrielle taught readers how to relinquish control, relax into a sense of certainty and freedom, find strength when they are down, support when they are lost, and joy in what might otherwise be pain. Now she has created this stunning journal to help readers practice these teachings in their own lives.